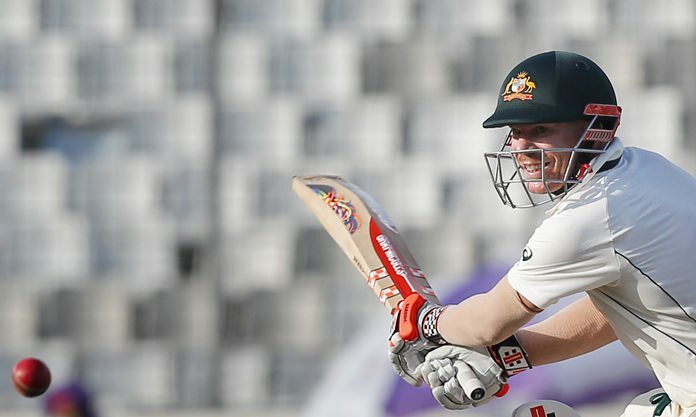 Dhaka, Bangladesh (AP) — Opener David Warner hit 75 not out Tuesday as Australia stayed in a position of dominance after Bangladesh set a 265-run target in the first test. At the end of Day 3, Australia reached 109-2 and need 156 more runs to register only their third victory in the sub-continent in the last decade. Australia captain Steven Smith, unbeaten on 25, gave Warner good support on the tricky wicket. Warner started rapidly, hitting two fours off off-spinner Mehidy Hasan in the first over. But Hasan then dismissed Matt Renshaw for 5. Left-arm spinner Shakib Al Hasan had taken Usman Khawaja (1), forcing him to continue his dismal form in the sub-continent as he top-edged to deep backward square leg after trying to play a sweep shot. Warner, on 14, survived a tough chance when he edged to first slip off Shakib Al Hasan’s delivery. Warner hit 11 fours and one six, facing only 96 balls. Smith believed he was stumped in the first ball he faced off Hasan and walked off. The TV replay, however, confirmed his feet didn’t cross the line. Coming off an epic series in India in which he piled up 499 runs in four tests, including three centuries, Smith was watchful throughout the innings and hit only one boundary. Warner kept scoring, much to the disappointment of the Bangladeshi bowlers. Australia offspinner Nathan Lyon bowled 6-82 to help dismiss Bangladesh for 221 shortly after the tea break. Lyon’s 10th five-for helped Australia claw back into the game when Bangladesh were in charge. Left-arm spinner Ashton Agar contributed with 2-55. Lyon broke through in the sixth over, dismissing nightwatchman Taijul Islam for 4 after Bangladesh resumed at 45-1. He then dismissed Imrul Kayes (2) with a delivery that carried extra bounce. Cummins gave the vital breakthrough just after lunch, winning a video review against Tamim Iqbal, who was caught behind. Tamim sent the ball across the rope eight times in his 155-ball 78. It was his second half-century in the match after his 71 in the first innings. Lyon then got the better of Al Hasan (5), who tried to clear the boundary but holed it out to cover. Mushfiqur Rahim stalled Australia’s progress with support from Sabbir Rahman. Rahim was then run out after scoring 41 off 114. Rahim’s dismissal sparked a collapse as Bangladesh lost three wickets in 10 balls without scoring a run. With 186-8, Hasan and Shafiul Islam took the score past 200, scoring rapidly. Lyon completed his five-for by dismissing Shafiul for 9. He then took Hasan for 26 to wrap up the innings.